Today was an emotional day for me on many levels, but one thing I’ve learned is that a day with Grace makes everything better. This morning I posted a remembrance article about my grandfather who died six years ago today. That had me fighting back tears several times throughout the day. I had a project scheduled to go to the printer today which brings along last-minute stress and anxiety. Because I knew I had to get the files out I canceled my hair cut appointment with Tammy’s sister, Kristan. Then 15 minutes after I should have left to make my appointment, I got a phone call and was told that the person who needed to sign off on the pages was gone. Kristan eventually cut my hair and I made my way home but way later than I had intended. When I got home Jake was getting ready to leave but told me that Grace might be coming over and I knew my day was going to end on a good note. I knew we were out of milk but hadn’t stopped because I knew Ashlee was going to be there soon and would need help unloading some boxes. When Jake told me Grace was going to be coming over, I knew something needed to be done about our milk shortage. I nearly texted Grace to see if she’d stop to pickup some milk, but she showed up before I got around to actually doing it. I told her we were out of milk and asked if she’d run down to Wisted’s to pick some up. Grace: Do you have a bike I could ride? Me: Yeah, but why not just drive there? Grace: What are you saying, that I’m fat? At that point I knew I had to get one of the bikes out of the garage. We don’t use our bikes unless Tammy gets the urge to ride them, which is usually about once a year, so I was worried that the tires would be flat. Fortunately they weren’t. When I got the bike out she started getting nervous. Grace: What if it gets stolen? I’s not like a $3,000 bike is it? Grace had on her emptied backpack – to carry the milk – and smiled as she took off down the sidewalk. I couldn’t wait for her to get back because I was sure she would encounter someone or something that would make her nervous. Grace: Oh yeah, there was a creepy guy there. Since she was starting to do her homework I didn’t ask questions. Plus I knew there would be plenty more opportunities for material. When Grace got back she brought in several Wal-Mart bags from her car. Grace: I hate buying my own stuff. Grace: My Dad says, “You’re a working girl now so you can buy you own stuff.” I hate it. She dropped her bags and her mood changed as she was going through them. Grace: Oh my gosh guys, I’ve got the coolest thing ever. Check out this calculator cover. Me: What about your banana sticker cover? Grace: Oh don’t worry, I got more stickers. I’ll just put them on my new cover. She handed me her calculator so I could get the old cover off. Grace: Don’t break it or you’re paying for it. She took the calculator back and began putting on the new cover. Grace: Check it out. They had a cheetah one but I didn’t get it cause I’m not a skank. She was overcome with pride as she was admiring her work. Grace: The things you can do with calculators these days. We then started talking about how Crystal Lake won NBC 5’s Prep Destination of the week for Friday night’s game between South and Central. That means NBC 5 will be there broadcasting live for Dance Friday. Grace: Jake’s like, “I don’t get what the big deal is,” and I keep telling him it’s like Hairspray come to life!! I’m so excited. I think Grace voted so many times that she may be single-handedly responsible for NBC 5’s trip to Crystal Lake. Grace settled in and started doing her pre-calculus homework. It wasn’t long before math was starting to get the best of her. Grace: Ohhhh…. Math will be the death of me!! She asked me for help but when she saw I wasn’t very useful she moved over to the computer. She found a site where she could punch in the problem and it would show her how to solve it. After a few minutes of computer-assisted help she was singing a different tune. Grace: I can do my homework so fast now! Grace: (looked down as she nodded her head) I’m such a cheater!! Grace: This thing is so helpful. I’m gonna make my Dad get me a membership, a real membership. Grace: Ok, this website actually helps me. Me: Yeah, it helps you cheat. Grace: No, it actually shows me how to do the problem. I’m not even lying to you. It wasn’t long before she was moaning, literally, about what all she had to do. Grace: Oh my God, I had SOO much homework. This is unbelievable. This is crazy. But being the resourceful person she is, Grace was able to re-motivate herself by pouring herself a glass of milk and getting a pack of Famous Amos cookies. Grace: I have a reward system. Every time I do a problem I get a cookie. A few Famous Amos later Grace was back in the groove and in a much better mood. Grace: Oh my God, I’m the smartest person on the face of the earth. And it’s NOT because of the website I found. Not as much as Grace. Grace had been working on her math homework for the better part of 2 hours, so there was reason for celebration when she started getting near the end of it. The closer she got to the end, the more her mind started wandering. She was still sitting at the computer when she thought out loud. 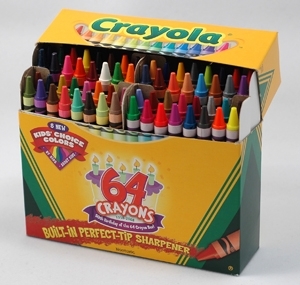 Grace: I got 96 crayons for $3!!! I’m so excited to use them. That’s all I’ve been thinking about. 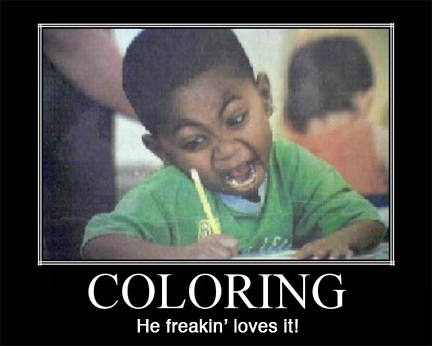 When she was finished with her math, she sat at the table, pulled out her box of crayons and tried to open them. In all of her excitement to color she was struggling to open the box so I offered to help. She nervously watched as I tried to open them. Grace: Don’t break it, don’t break it. To calm her down, I handed her my pocketknife so she could finish the opening process. Her eyes and face lit up with anticipation as she pulled back the top of the box. But they were quickly snuffed out. She sat the box down on the table and sat back in the chair with a disapproving look on her face. Grace: These are not in the right color order. She sat there for a few seconds thinking about how she could correct this mistake. I was shocked when I saw her solution. Grace: This is my crayon holder. She had been so meticulous about how the box was opened that I couldn’t believe she wasn’t going to use it anymore. 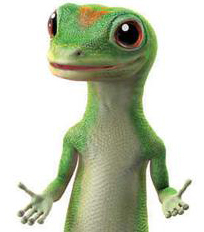 The new Geico commercial came on and I commented on how I like the way the gecko says butter and jam with his accent. That launched Grace into a discussion about how the gecko we see today doesn’t look like the original one. She even went to YouTube and found some of the old commercials and played them so I could see what she was talking about. But in the end, she seemed to like the current one a little better. Grace: Look at him, he’s so high tech and beautiful. Jake was the first person to arrive back home. 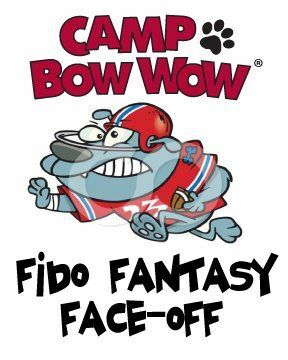 He’d been at Camp Bow Wow to draft “players” for his Fido Fantasy Face-Off team. The employees filled their teams with dogs that they hope will score enough points to lead them to victory each week. Jake came in all excited and telling us about the draft. 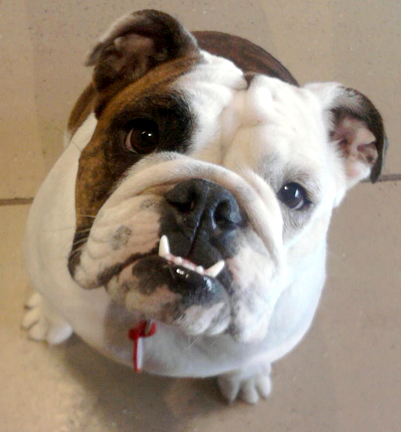 With his first pick he selected an English Bulldog named Daphney. Savannah was ineligible for the draft since her “brother” works there. He said everyone starting laughing because they all figured he would pick Daphney first. As exciting as the draft was, Jake couldn’t keep his mind off the gnawing feeling in his stomach. Jake: Oh my God, the last 30 minutes of the meeting I had to fart so bad. I tried to get it out when I walked outside but it wouldn’t come out. I thought maybe if I leaned to the left when I got in the car it would come out, but it didn’t. Then when I was backing out, “bbbrrrrrrrtttttttt.” It was like 8 seconds long. Then I had one in the car that was 5 seconds long and right before I walked in I had one that was 3 seconds long. During the time Grace didn’t say anything but you would have thought she had really experienced it by the look on the face. A little while later Jake was standing near Grace looking at something on the computer when he shushed everyone and farted. He gets that from Tammy. Who Touched My Famous Amos? Who Touched My Famous Amos?! Now that his stomach was empty, Jake was wanting something to eat. 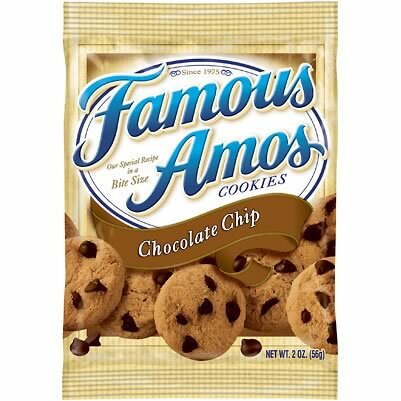 He grabbed the Famous Amos bag sitting next to Grace and quickly put it back down when he realized it was empty. Grace: Did you just eat my last cookie? Jake: No, there wasn’t anything in there. 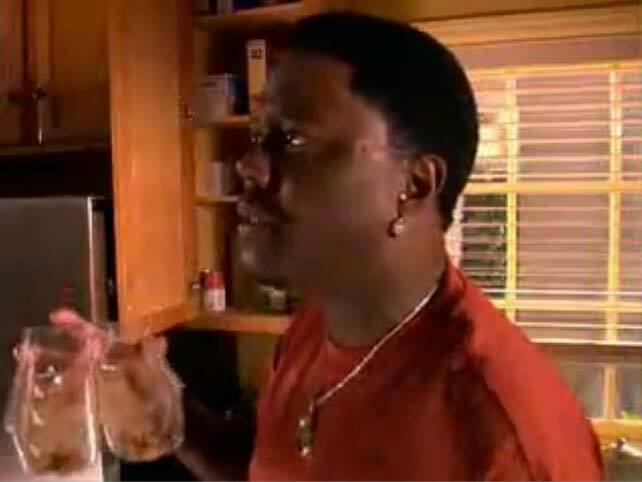 Jake went into the kitchen and got a non-Famous Amos cookie. He came back over to Grace and dunked it in her milk. His unauthorized dunk didn’t bother her so much, but his sloppy finish did. Grace: Ewwww… You got milk on the H key. Jake: (sarcastically) Oh yeah, that’s what I did. Grace: I watched you drop it on there. How am I sposed to type my password now? Apparently they didn’t wipe up the milk because a little while later Grace found it again. Grace: Oh man, my finger went in the milk!! Jake’s a big fan of America’s Got Talent so throughout the night he watched the episode from Tuesday night, where the contestants perform, as well as the Wednesday night’s elimination episode. 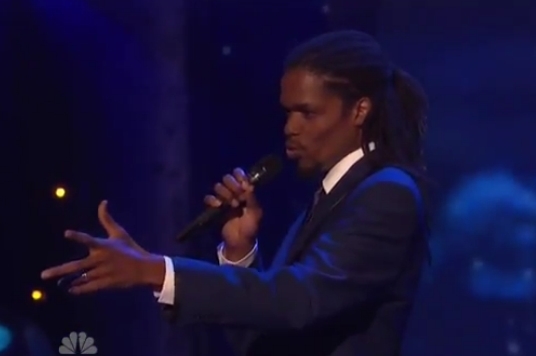 Both Jake and Grace love Landau Eugene Murphy, Jr., and I knew they got excited when he performed, but I wasn’t prepared for HOW excited Grace got when she heard Landau start singing. While they were announcing him she was feeling a whole range of emotions. Grace: I’m so Team Landau, but I’m so nervous for him. But when she heard Landau start into Sinatra’s “I’ve Got the World on a String,” she jumped out of the chair, started jumping up and down. Grace: This is my song!! This is my song!! I could tell by the look on Jake’s face that he didn’t know what she was talking about. The next thing I know, she’s got her phone next to her ear with her hand covering her mouth. The next few seconds sounded something like this. After about 20-30 seconds, Jake glared over his shoulder at her and Grace knew what that look meant. Grace: I gotta go. No, I gotta go. She waited for Landau to finish before telling everyone why that song was so important to her. She then stood up and demonstrated how she was singing. After Tuesday night’s show came the elimination one. Jake fast-forwarded through most of the pointless parts, stopping only when someone was about to be sent home. They called Landau and Anna Graceman, an 11-year-old girl who sang Motley Crue’s “Home Sweet Home,” to the stage for elimination. While the host was keeping everyone in suspense, Grace was a nervous wreck. She was still sitting at the table with her knees pulled up to her chest. Her fingers on both hands were crossed and pressed against the sides of her face. When the host announced that Anna Graceman would be moving on to the finals I thought Grace was going to cry. She stood up staring at the TV with her mouth wide open. She didn’t move while Landau congratulated Anna. Then the host walked up to Landau and told him that he was SAFE too. I thought Grace was going to cry again because she was so excited. As the show was winding down, I realized that I had forgotten about all of the stress from earlier in the day. Gallery | This entry was posted in Daily Life, Gracefully Speaking and tagged 2011, daily life, family, funny, Grace, humor, life. Bookmark the permalink.